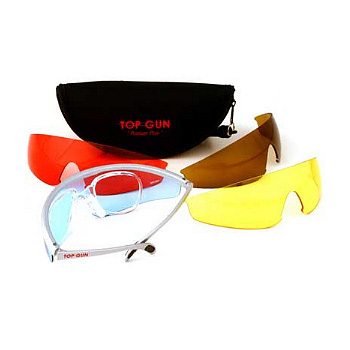 Safety glasses for use by those shooters who have to wear prescription lenses, or those who just prefer the wrap around style. We would recommend this style for all Trap or DTL shooters due to the increased distance between the bridge of the nose and the bottom of the frame. The glasses feature a polycarbonate frame for comfort, light weight and strength. The 2mm thick polycarbonate lenses provide full impact resistance (we tested the lens by shooting directly at them from 10m !! ). The 5 interchangeable lenses have filter colours chosen to offer improved contrast under varying light conditions. Brown - for sunny conditions. Orange - for high definition clay recognition. Yellow - for poor light conditions. Blue - all purpose. Grey - eye protection only. The set is complete with a soft (clip on) carrying case & lens cleaning cloth. What a great product! These glasses are very light considering they have a prescription insert. The different coloured lenses really do cater for all light conditions. Would recommend to any glasses wearer who needs a solution for clay shooting eye protection.